But, where is the competing Option B? Obviously, we have questions with regards Option A. Option A happens to nicely dovetail as well with components of the Torah and with key components of Lurianic Kabbalah – aside from being universalistic and humanistic and empowering – to all. So, therefore the next obvious step might be to stack our Option A against Option B. But, what is Option B? And, where is Option B? Which is the salient – contender, challenger, old champion? You might say that there are 100+ contenders? And that they are too numerous to count? OK, but which is the salient contender? While Summa makes numerous assertions, they all dovetail nicely into the Potential framework – its unifying ‘spinal column’ – and the overall construct is philosophically elegant. It is not clear which other metaphysics challenges it. *a Peter Atkins, On Being (Oxford, England: Oxford University Press, 2011), pp.1-2, 5, 11-14, 18, 26-27, 33, 38-39, 60-61. *b Scientist Peter Atkins is the author of almost 70 books, including Galileo’s Finger: The Ten Great Ideas of Science, Four Laws That Drive the Universe, and the world-renowned textbook Physical Chemistry. A Fellow of Lincoln College, University of Oxford, he has been a visiting professor in France, Israel, New Zealand, and China, and continues to lecture widely throughout the world. The Summa series started out with God and Evil (1988). 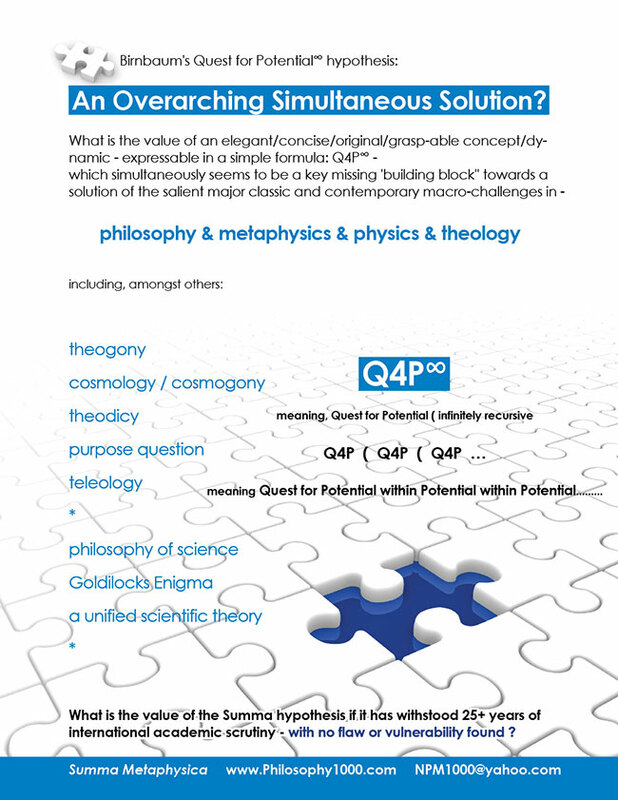 In that work it was demonstrated how Q4P∞ potentially might not just solve the classic philosophical-religious conundrum of Theodicy, but would seem to simultaneously solve as well several other key philosophical issues in metaphysics. As pointed-out in this volume, God and Good, many/most/all major fields – not just Metaphysics – would seem to have gaping holes in them. The appendix relating to noted scientist Atkins, for instance, highlights via excerpts from his works – gaping holes in the physical sciences. This ‘gaping-hole’ issue ranges through Astrophysics, Biology, Anthropology, Philosophy, Theology, Cosmology, Life Sciences and on-and-on. The key fields – and probably all related fields – have major gaps. Thus, we have an intriguing potential simultaneous solution on a very grand scale. Are we catching your attention yet? Evolutionary Biology: What drives Evolution? Astrophysics: What ignited/drove the Big Bang, in particular? Cosmology: What ignited creation and maintains the Cosmos more generally? Metaphysics: What is the purpose of Man, the cosmos? Astronomy: Why is the cosmic order so wondrous? Life Sciences: What drives Life? What is Life? What makes Life so tenacious? Anthropology: what drives the ‘Ascent of Man’? Love Science: What drives Love? Religious Philosophy: Theodicy question – If there is a God who is all-powerful and merciful, why is there gross evil? One cannot expect to clinically prove a dynamic Framing Belief* of the Cosmic Order – of the overarching/infinite magnitude of Quest for Potential∞. But ideally one could provide a rather compelling circumstantial/supporting/empirical case. Perhaps we have done so. Supreme Court Justice Louis Brandeis said that ideally when solid circumstantial evidence is presented in court, it would be like a spider’s web – so strong that nothing could hope to escape. According to my consulting litigators, in an ideal legal cobweb, all the inferences and implications are internally consistent – like the fabric of the web. Ideally, a powerful case would clearly trump competing scenarios. Perhaps we have done so here. There is no (repeat: no) contradictory evidence to Summa’s hypothesis. Not one iota of contradictory information. After 5,000+ years of accumulated data and wisdom – across a myriad of fields. Over a 40+ year period – I have quite-carefully reviewed field-after-field – to reality-check Summa. Does Summa – overlaid over the particular field – enhance the field – or contradict the field? In each and every case, overlaying Summa either has a neutral effect or, more often, enhances the field. Often, Summa radically enhances the field. There are no exceptions. Meaning, there are no instances where Summa detracts from the field. Thus, on weighing all the evidence, the probability that Summa is essentially on-the-mark, is quite high. And the possibility that it is totally off-base, is quite remote. Moreover, there is massive and compelling affirming evidence – from multiple directions, avenues and fields – and from careful, direct and empirical observation – to buttress Summa’s hypothesis. One has only to objectively weigh the hypothesis. In addition, as explicated, there is de facto no competing metaphysics. There are no eyewitnesses coming forward from the Creation-point. With regards the Creation point, Summa has made-a-case for circumstantial and deductive (and spiritually consonant) evidence. And contemporaneously, we are all, indeed, very direct eyewitnesses. And we can all carefully evaluate the contemporary situation – across the panoply of fields – and in our own lives – through a Summa lens. Very straightforward: Does it work? Respectfully, the proposed Summa paradigm appears for all intensive purposes to be so-to-speak bulletproof – vis à vis its key assertions. The initial exposition of the Quest for Potential∞ concept in 1988 (via Summa I) has withstood 25+ years of global scrutiny. No vulnerability or weak point has been discerned. Question: Is there another viable game in town? Those insistent – for whatever combination of reasons – on resolutely preserving the pre-Summa status quo, have only limited options, and none of these are good options. History may not treat them overly kindly. We respectfully believe that Summa will prevail, because its core themes reflect the eternal realities of the cosmic order. Potentialism theory - crafted and championed by conceptual theorist David Birnbaum of Mahattan – proposes that Infinite Potential is eternal, overarching and transcendent. According to this original proposition Infinite Potential marshals the equations of physics-math to reach their fullest actualization via igniting and driving the cosmic order towards ultimate potentialities. Note that quantum physicist Seth Lloyd of MIT, as well, positions the equations of physics-math as centerpiece in the creation of the cosmic order. ( see https://www.summametaphysica.com/lloyd-of-m-i-t/ ). Randomness theory - championed heavily by the British atheistic academic community - rejects any transcending dynamic or any purpose to the cosmic order whatsoever. According to this ‘theory’ all is random happenstance. Although Potentialism takes no ‘hard stance’ vis a’ vis religion, it does provide a potentially rich metaphysical anchoring for it. As well, Potentialism so to speak ‘solves’ key issues in religious philosophy. The atheistic community has hyper-aggressively (typically anonymously) vainly endeavored to de-legitimize both Birnbaum’s treatise, as well as the April 2012 four-day international academic conference at Bard College focused on it ( see www.conference1000.com). The attacks have not ‘stuck’. Indeed, they seem to have ‘backfired’ on the ‘stone throwers’. Let us step back a moment at look at the metaphysics chessboard. Roughly ten inter-related classic metaphysics questions have been at the fore of discussion from time immemorial, and roughly another ten new ones vex the academic/scientific/theological community today. The iconic classic philosophical and scientific figures – from yesteryear and today - have grappled with these issues one way or another in their respective writings and discourses. Respectively, none of their overarching schemas, where they have been proposed, have been accepted by the academic community today. The field has been ‘wide open’ for 5,000+ years - up until Summa Metaphysica’s Potentialism Theory (1988), that is. Let us look at a selection of twenty core metaphysics questions and see how Birnbaum’s Theory of Potential - and then the entrenched establishment’s Theory of Randomness - comes down on each of these twenty clearly defined issues. 1) Why is there anything at all? 2) Is there an eternal dynamic? a so-to-speak ‘key’ to the universe? An underlying supra-dynamic/supra-imperative? 4) What ignited the Big Bang? 5) The Goldilocks Enigma: Why is the universe ‘just right’ for life? Birnbaum: Life is a primary goal of uest for Infinite Potential both as an intermediate end in-and-of-itself and as a platform for extraordinariation. 6) Why does ‘judicious design’ seem to permeate our universe? 7) Why does there seem to be a ‘hidden reality’ to our universe? 8) Why does nature seem to have a ‘mathematical subtext’? 9) Is there a ‘script’ to the universe? 10) If there is a God what is the essence of God? 11) What was the catalyst for life? 13) Why is there a virtual kaleidoscope of life? 15) What drives (non-evolutionary) self-organization and self-patternization (my term), like snowflakes all being unique? 16) Why is the universe ‘bio-friendly’? Birbnbaum: Because bio is a great platform for Potential/extraordinariation. The more precise statement would be that the universe is ‘bio-oriented’. 17) What was the catalyst for consciousness? 18) Does Man have a purpose? 19) Does Mankind have a purpose? 20) Is there a purpose to the universe? Thus, the battle lines are clear-cut. Birnbaum layers one single elegant concept – Infinite Potential - across the entire spectrum of issues – and across the timeless cosmic continuum. Aside from the one issue of Evolution (i.e. one issue out of twenty), the Establishment does not even purport to provide one single answer. [And its (genetic survival) ‘explanation’ of Natural Selection is ‘wanting’ to put it gently. ] Thus, for 19 of the 20 issues, Randomness offers no answer at all, whereas Birnbaum is elegantly deploying the same precise core theme - Infinite Potential – across all twenty questions: the quintessential ‘simultaneous solution’. The contrast is stark, to put it mildly. One can now readily understand why to the proponents of randomness, Birnbaum is the ultimate intellectual threat, to be stopped at-all-costs. The Establishment cannot attack Birnbaum as it has attacked the ‘intelligent design’ proponents as being a ‘stalking horse’ for Creationism, as he clearly is not. Furthermore, Birnbaum methodically and clearly addresses all key issues ( see in-depth 18-panel www.sequence1000.com ). The Establishment does not. Moreover, Birnbaum clearly lays-out ‘his case’ in a 22+ panel presentation ( see www.paradigmchallenge.com ). The Establishment offers no such blueprint. It primarily disses challenging paradigms. Birnbaum’s construct is a ‘lean and mean’ pure intellectual play. It is so to speak ‘fat free’. It is, as well, unburdened by any ‘baggage’ from any dogma. It is ‘ideology-free’ – unlike Randomness which has allowed a global lay ideology to merge with academia – a volatile mix. Birnbaum is proposing Infinite Potential as new ‘framing concept’, i.e. as the core ‘cosmic imperative’. In other words, he proposes Infinite Potential as the underlying bedrock dynamic of the cosmic order. If Birnbaum’s Summa Metaphysica treatise ( see www.philosophy1000.com) is even roughly on-the- mark, the consequence would, indeed be a profound grand unification of spirituality, science and philosophy. Most fields of study and most dimensions of intellectual inquiry would be impacted. As a consequence of Birnbaum’s offering-up his cosmic centerpiece ‘potential’ in 1988 (Summa I ) and steadfastly advancing the theory both via Summa II (2005) and via symposiums and other modalities, many notables view Birnbaum as the progenitor/originator/founder of a new field, Potentialism ( see www.codecoverstory.com ). The author is clear to point out, however, that he views his role as a ‘supporting’ one, and not as a stand-alone field or belief system. Andrei Alyokhin, Associate Professor of Biololgy and Ecology at University of Maine wrote December 2012: “It is reasonable to propose the quest for Potential as a working hypothesis for explaining the impetus behind the cosmic dynamic.”(see Summametaphysica.com/alyokhin/).